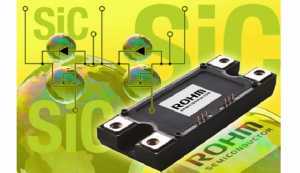 ROHM Semiconductor presents new solutions for Power and energy management in the automotive applications. xEV (Electric Vehicles) can contribute to substantial reduction CO2 emissions, and India has laid out optimistic plans to accelerate the adoption of EVs by year 2030. Energy savings and reduced system costs in all kinds of applications are heavily influenced by choosing the right power device. With its new developments resulting from the group’s extensive research and design initiatives, ROHM is able to offer customers not only a full line-up of efficient, compact products for their applications, but also a complete solution for the power circuit designs. Bharat Stage (BS) VI emission norms in India by 2020. In the backdrop of BS-VI emissions norms to be implemented in India for all vehicles, including two-wheelers, Electronic Fuel Injection (EFI) Control Systems will be required on two-wheelers, by 2020. Fuel Pump with Brushless DC (BLDC) Motor forms an integral part of EFI System on two-wheelers.